Want to stay in a classic doo-wop hotel? Here are a few of the Wildwoods’ mid-century modern gems. 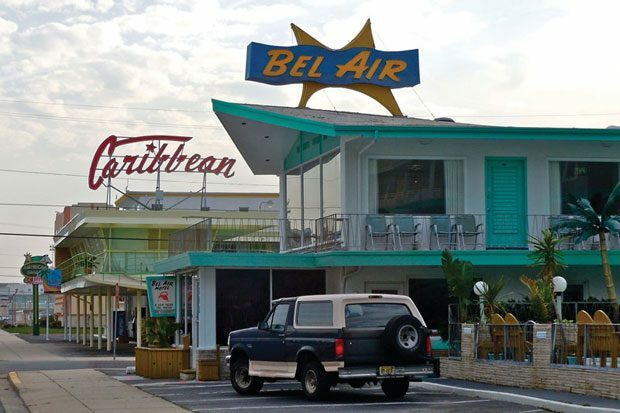 The Bel Air Motel, located on Ocean Avenue in Wildwood Crest. Listed in the National Register of Historic Places, this doo-wop landmark, built in 1957, features a futuristic levitating ramp, spaceship lights and the first plastic palm trees planted in the Wildwoods. All rooms include 1950s-style furnishings and modern amenities. Located across the street from Wildwood Crest beach and two blocks from the boardwalk. High season rates: $219-$269. This property was completely redesigned in 2000 to accommodate a kidney-shaped pool, an additional floor, a large glass-paneled lounge with geometric-shaped roof, and plenty of aluminum and neon. For a true retro experience, book one of the property’s two vintage Airstream trailers. Located a short walk away from the famous Wildwoods sign just off the beach. High season rates: $167-$301. With its candy-colored doors and lip-smacking neon sign, the Lollipop, built in 1959, is a doo-wop landmark in North Wildwood. Renovated in 2004, the Lollipop has modern amenities to complement its playful ’50s design. Located two blocks from the beach. High season rates: $187-$192. The six-story, oceanfront Pan American celebrates its 50th anniversary this year—still sporting its rooftop rotating globe. The hotel features heated outdoor pools, multitiered sundeck and on-site restaurant, Alosi’s. High season rates: $250-$403. Named for the mid-1950s Chevy that epitomizes the doo-wop era, the Bel Air, built in 1957, sports a seafoam-green pallette, angular roof, poolside plastic palms, globe lighting and hand-built tiki hut. Located one block from the beach. High season rates: $168-$220. There are no photos with those IDs or post 48483 does not have any attached images!